THIS IS IT!!! 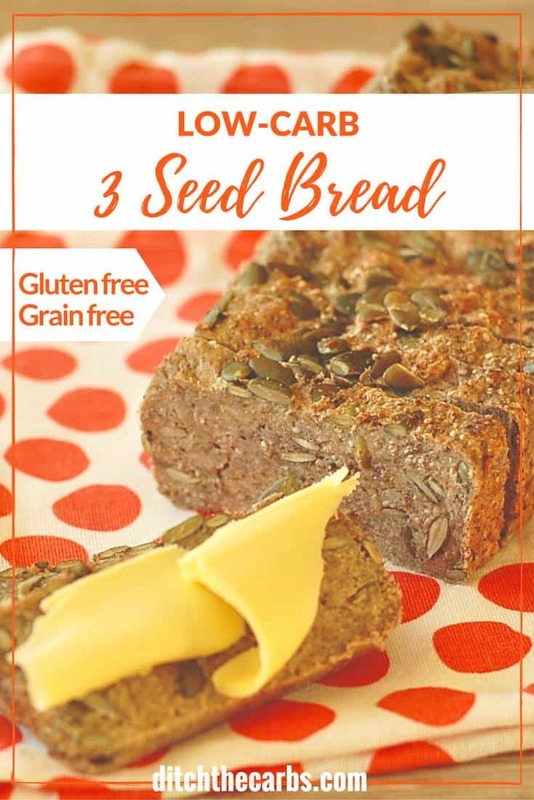 The famous low-carb 3 seed bread that kiwis and Aussies have been begging me for. 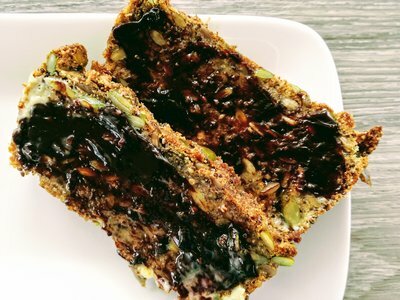 Low-carb 3 seed bread is absolutely perfect with melted butter and Vegemite or Marmite (depending on which side of the ditch you live). 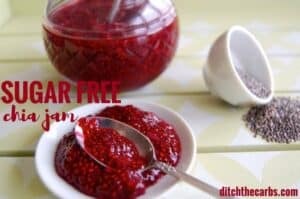 Gluten free, grain free and super easy recipe to make. See how. If you are missing bread when living low-carb, I’ve got ya back!!! 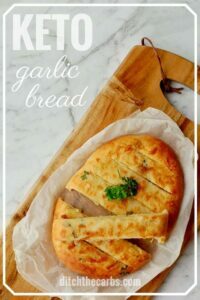 I have a whole list of easy recipes at the end of this post! I posted a little video on Instagram when I finally knew my recipe was perfect. I served it warm with butter and Vegemite dripping off the sides, well it received thousands of views and so many hilarious comments. For those of you far far away from us Kiwis and Aussies, a famous snack is to enjoy Vogels bread (which is a whole grain, seeded loaf with many variations) toasted (some swear you must toast it twice for the authentic crunch) then slap on plenty of butter and as much Vegemite or Marmite as you can handle. These are rich, thick, black yeast extract spreads which have a wonderful beefy salty flavour (although it is actually meat-free). You generally love’em or hate’em. Yeast spreads have a tiny amount of barley extract (i.e. : sugar) but because yeast extracts are so powerful (read: strong) you only need a small amount. So, in reality, it is negligible. But as always, read labels. Some other yeast extracts available around the world have thickeners, cornstarch, cornflour and wheat. It took me quite some time to develop the perfect low-carb 3 seed bread. Psyllium is a tricky little sucker to work with. It never actually cooks properly because it is so absorbent of liquids. It’s perfectly fine for the middle of the loaf to be cooked (so a knife pushed in will come out clean) but when a cooked loaf is cut, it may appear to be a little soft and moist. That is how it should be and will still toast beautifully. It had to be almond flour free (so it can be included at schools with a nut-free policy). Use the minimum amount of eggs (too many readers are sensitive to the taste that many low-carb bread recipes have that use a large number of eggs in the recipe). Click here to see my archives of school lunch box ideas. And take a look at my book Low Carb Easy Family Meals – how to be a low carb family. It’s a great way for everyone to start living low carb, ditch the sugars and ditch the junk food once and for all. See below for more low-carb bread recipes. This is it!! The famous 3 seed bread kiwis and Aussies are raving about. Perfect toasted with butter then sweet or savoury toppings. Place all the dry ingredients in a large mixing bowl and stir. Add the melted butter and eggs. Stir until almost mixed. Add the warm water and stir until all the ingredients are full incorporated. Place in a loaf tin and bake at 180C/350F for 35-45 minutes. Ensure it is golden on the outside and cooked in the centre. Cooking times may vary with each oven. « Portion Control – What does 30g protein look like? Do we need to use chia to absorb some liquid or could I sub poppy seeds or even sesame? They would be lovely. The chia seeds do absrob some liquid so add your substitutions of the poppy seed or sesame seeds then monitor how much additional coconut flour may need to be added. Are the pumpkin and sunflower seeds raw or roasted -salted or unsalted? Raw and unsalted – great question. Hi, I am going to try making your receipt this weekend. Was wondering what you thought about substituting whole flax seeds for the pumpkin seeds? I have a large container of them and want to use them up, but if you think pumpkin works better I will buy them. If you think the flax seeds would work, would I use the same amount? Thank you for your time, I look forward to hearing back from you. 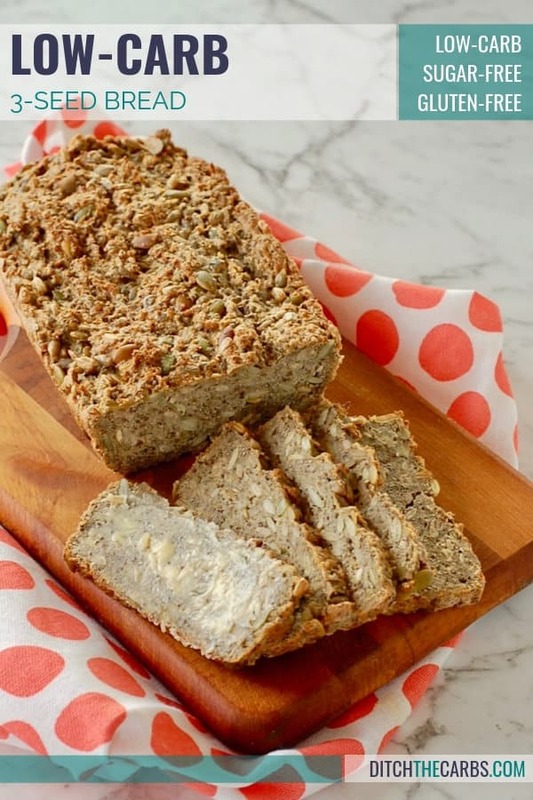 Maybe try half pumpkin with half flax seeds to give the bread a lovely variety of texture and flavours – yum! Is it possible to grind up the larger seeds so they’re not so big to use in this recipe? Sure thing, but I like the big seeds in this recipe to replicate the savoury seeded whole loaf I miss. But grinding the seeds up to be a bit finer would work. You may need to add a little more liquid ingredients as there would be added seed powder now. I’m sure you can but the more one chews one’s food, particularly any bread, one won’t eat so much! Question: how many ounces of butter should be used? I find that “sticks” of butter can vary between brands. Really looking forward to making this! Thank you!! 1 stick is a standard US measurement = 113g butter or 1/2 cup. This recipe calls for 50g butter which is the equivalent of 1/2stick (give or take a few grams, it’s not imperative). This looks great, I will try to make this. Could you substitute ground flax seeds for the chia seeds? Since when combined with water, chia seeds form a gel-like substance, suitable for replacing eggs– and ground flax seeds do the same. I have never tried this substitution. If you give it a go, I’d love to know how it works out. We love this bread but found it a little too “lumpy” with the large seeds.It made it difficult to cut and toast. We tried it again after whizzing the seeds slightly in the blender to break them up a bit. Much better texture, easier to cut thinly, toast, slightly more “nutty” flavour. Definitely fab with butter and marmite. Hi Libby…thank you for a lovely recipe. We loved the bread. I doubled the ingredients and baked on a cookie sheet (14×10). It baked evenly with a lovely crust. My question is regarding the macros…I just checked the recipe on a USDA database. The macros were as follows…fat -11.8 g…….protein-6.5g and carbohydrate 19.8g and fibre was 13.4g. For some reason there is a discrepancy…would appreciate your input. Are you sure you didn’t double the nutrition values too? Or possibly that you did not include that you made double the servings? My nutrition is per slice. I use cronometer.com which are the USDA database too. My recipe makes 15 slices. There is something really out of whack with your calculations, it’s probably something as simple as adjusting the servings you actually made. Could oat fiber possibly work instead of psyllium? Just wondering since I have it already. This looks delicious. This bread recipe is pure genius. Best bread I have made. It may have changed my life 🙂 I used psillium powder, but otherwise followed the recipe exactly. I cut it thin and froze it, I take out a couple of slices and defrost/toast them in the toaster, they are almost like crackers, which I love! Thank you!!!!!! Awesome result! I wish I still had a toaster, I threw it away 2 years ago thinking I would never find a low-carb bread I liked. Can I use Psyllium Husk Powder instead of Whole Psyllium Husks? I just baked this bread using psyllium husk powder, but cut the amount in half (vs the whole husk amount the recipe specifies). This worked well. The first time I used the powder, I used the full amount — as specified for whole husk. Big mistake. The bread was hard as a rock, and I had to triple the amount of water just to stir the dough. Would be nice if the site gave a little more info on the recipes vs all the marketing blah blah. Good morning! You probably hate being asked questions about which ingredients can be substituted for others but I’m in a bit of a quandary. 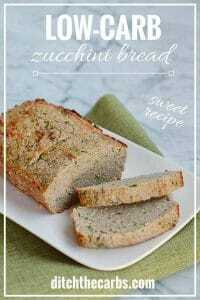 I would love to make this bread but unfortunately where I live Psyllium husk is very expensive. 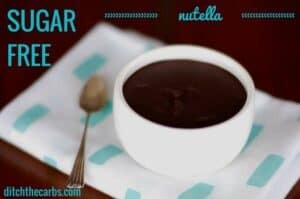 The 75g called for in this recipe is an entire packet which comes in about 5 euros! So, do you know if there is another way to make this loaf? I’m impatient to slather it with my vegemite! Sorry, but no. Psyllium is integral to this recipe. I wonder if you are buying the wrong sort of psyllium husk. It is very affordable in most places in there world. Are you sure you’re not looking at the pharmaceutical type that is used for constipation? 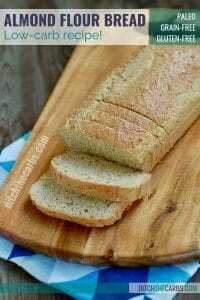 Alternatively, why not try my almond flour bread that requires a lot less psyllium husks. Hi Libby and thanks for your reply. Unfortunately we can only buy it from the pharmacy here in Greece, or in tiny little bags from biological product sellers. I have just put it on my shopping list for my next visit to Oz. I have also found that almond flour is prohibitively expensive here too, and yet coconut flour is reasonably priced! I will attempt this bread this week and see how it goes. Hi Emma, I too live in Greece and order all my ingredients from Amazon UK. They take a couple of weeks to get here but are much cheaper. I even order loaf tins and others from them. Hi,my name is Glenda from Australia and try buying psyllium husk from suppliers of bourse and other farm animals. Same product but in bulk amounts and very cheap. My spouse and I in heaven, bread heaven🤗. I was looking for a delicious low carb bread. I tried so many recepis and this is the one and only. It is easy to make tastes like heaven, it is yummy, awesome consistenz, easy to cut, we love it. It may not be the right bread for americans, but for everyone how doesnt like the american bread , it is the real deal. Wow Sonny, I love your recipe review. This is one of my favourite bread recipes too. It’s the real deal alright. And cover it with melted butter – well it takes it to another level. Yummmmmm. How doyou store this bread? Freeze or keep I the fridge? Or both ok?? I made this exactly by the recipe, it is tasteless. I tried toasting it but still not good. It needs something. I did add the salt but its still so bland! Hmm, I ‘m not sure how all those seeds can taste bland or tasteless. Did you add lots of butter or avocado as a topping? could I substitute coconut oil for the butter? I love this recipe, so easy to make. Today I sliced it very thinly, placed on baking paper, sprayed with oil, and baked for about 15 minutes in total in a 225 degrees Celsius fan oven, turning and respraying with oil 1/2 way through the cooking. Left the slices out to cool, they are crisp, and a great substitute for crackers. What size loaf pan, please? I have both quick bread and yeast bread siz. Absolutely LOVE this recipe! (I swear, in another life I was a squirrel! Bring on the seeds!) After meticulously entering all the ingredients into My Fitness Pal recipe tracker, the total calorie count comes out as 150, not 109. Fat, carbs and protein are close but the total calories are WAY off. Any idea why? Hmmm, My Fitness Pal can be fickle (too many “user added” entries), which is why I use cronometer.com . Squirrel on! 😉 Love it! Libby, I live in Texas, U.S.A. I have not found an easy way to convert the measurements to American, cups, teaspoons, etc. Is there a way that you can do that or is there an app that we could type a recipe into and have the amounts converted?? I know that many recipes will not work if the measurements are not correct. Thank you so much for all your information. This is my favourite bread! I substitute psyllium for flaxseed meal and put extra sunflower seeds instead of chia as I don’t like the way it sticks in my teeth. I also double the recipe and make in a large loaf tin. Works perfectly every time! How does everyone store theirs? Any idea how long it would last in the fridge? I put mine in a sistema container and put some kitchen towel under to absorb any condensation….I’m not too sure how long it lasts, but if it’s getting a bit dry I just make cheese toasts of the slices in the oven…. Great idea! Ill try the flaxseed meal substitute! What is the alternative for psyllium husk? The texture was great but too eggy for me so next time I’ll try the egg white and yeast version above in comments. The chickens (my free ranging girls who make eggs that are too eggy) enjoyed it-nothing goes to waste here! No way should it look remotely black. I would check your coconut flour which can sometimes react with baking powder (check that too) that has aluminium in it. Check the expiry dates of everything you used, this doesn’t sound right at all. Hi Libby – I found I needed more description from you. I added my two eggs (admittedly they were small) and the 250ml water but the consistency was still very dry and crumbly. I added more water (at least 100ml more) and two more eggs to bind it, but not sure what it should look like. I had to press my dough into the bread tin – should it be like this or more like a traditional bread consistency where it ‘plops’ in? Also…did you line the tin with baking paper? Obviously I like to follow recipes to the letter! Thanks. Hmm, I’m not quite sure how it can be so crumbly and dry with so much liquid? That really sounds like something has gone terribly wrong. Did you add too much psyllium perhaps? I used a silicon baking loaf ‘tin’ and so lining is required, if however I was to use a traditional baking tin, yes I always line mine for any baking so it is super easy to remove. Yum! What a great bread I am in love! Was a bit low on psyllium so added i n some linseed too. Took the tip from another comment & cooked45mins. Glazed the top with olive oil too for a shiny surface. Thanks! can’t wait to make again! Libby I would love to try this, however I only have psyllium husk powder. Could I use that and would the amount change. Many thanks. Hi do you think I could replace the coconut flour with something else as I cant eat coconut maybe sesame seed flour? You could try but coconut flour is not easily substituted as it has it’s own amazing qualities. You could experiment using sesame seed flour, just don’t hold me accountable for the results 😉 I would begin by adding more and more sesame seed flour until you get the desired consistency. Here is an excellent article explaining the difference between coconut flour and almond flour. I just put it in the oven, when you say fully incorporate, donyou mean that it becomes doughy? Mine was more crumbly so I added a quarter cup more water and more like poured it into the loaf pan. Did I do something wrong? The dough is quite a wet/damp dough. You just need to ensure all the psyllium is mixed thoroughly otherwise the loaf will have pockets of dry psyllium. The dough should be the consistency of wet play-doh. Mine was very crumbling and very difficult to eat; as if the psyllium husk was too dry. We were very humid that day also, so I don’t know what went wrong. Any ideas? It sounds like you needed to add more water. The final bread should be a damp play-doh consistency. The humidity will definitely have affected the psyllium in some way. 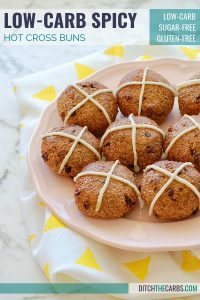 I made it today, but because I had no time to bake it in a loaf I used good sized ramekins and I made a few little rolls too….I only have extra large eggs at home so I added some golden flax seeds too…. Hubby loved it…me too…..children weren’t really convinced, but who knows….they might want some the next time I’m making it….because I’m going to make it many times in the future…. What a superb idea! Thank you. Great recipe, so easy to make! I’m really enjoying having marmite on toast for breakfast again! I inadvertantly baked mine for much longer as was distracted by a phone call, and it still turned out great! Awesome, so glad to know how forgiving this recipe is. I just made this. It is amazing! 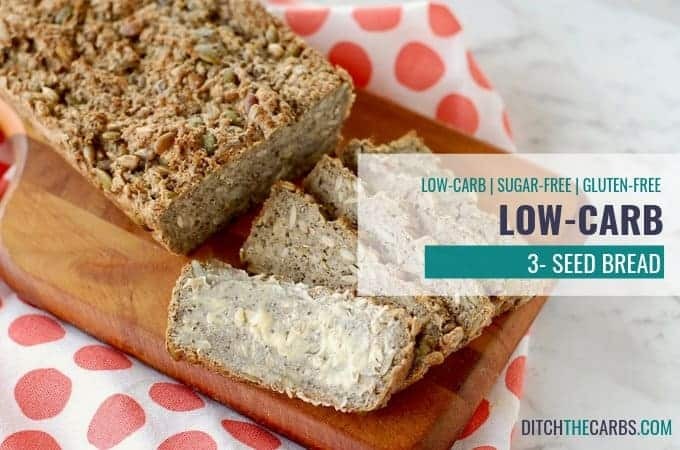 Best low carb bread! I did have to add 25grams of ground flax seed because I didn’t have enough psyllium husk. I like the nutty taste of flax so it worked out perfectly. I would double the salt or use salted butter. It’s just lovely. Thank you for such a great recipe. Just made the 3 seed bread. Couldn’t wait to try it and it sliced up beautifully when still hot. Nice flavor with some butter. Yum! Also have made the berry chia jam. That is lovely as well. Thanks Libby. If you make a low carb lemon curd/butter recipe I will be in low carb heaven! I have just baked this, and I am really quite amazed that these ingredients work, but they do! We found it tastes best with lots of butter and vegemite, in preference to the chia berry jam. I think it is the saltiness of the vegemite that enhances the taste. Have to be disciplined to stop at two slices! Looking forward to trying it in the toaster tomorrow. I must say it is also a simple/easy recipe to make. I love easy recipes and easy ingredients. It took me a while to get the ratios right for this bread but it works a treat huh? I am so glad you are enjoying it. I like it with butter, Vegemite or berry chia jam. Did others that make this find that it did not rise much? I found the batter really weird, or different from other bread batters. Yes it doesn’t rise much at all. It is a dense 3 seed bread, similar to many artisan grain breads. I can’t eat coconut flour, can you replace the coconut flour with almond flour? There’s so little I can’t imagine it would make much of a difference. You could but that would need a lot of calculating to change many of the ingredients. This article explains how coconut flour and almond flour differ enormously and cannot be converted easily. Coconut flour is incredibly absorbent so requires many eggs and only requires a small amount to do it’s job. So swapping in almond flour, you would require less eggs and more flour. So sorry, not the answer you were looking for. They both behave totally differently. Hello! I have psyllium husk powder – is that OK to use in place of the whole husks? Same quantity? I used powder instead of husks and it worked out fine, same quantity. Have since purchased husks and am trying again, will let you know if it’s noticeably different. Yum! Just made this and it’s sooooooo delicious! Thanks so much for the recipe! Do you reckon it will freeze ok? Really looking forward to trying this Libby! Do you think linseeds will work instead of the chia? I’m sure that would work too. The chia seeds may have absorbed some water in my recipe so if they are omitted you may need to add an extra tablespoon of psyllium to make up for them. Do I have to use whole psyllium husks or can I use the psyllium powder? If I can use the powder, how much? Any substitute suggestions for butter? Oh Libby what have you done to me?? I’ve just taken mine out of the oven, and I’ve demolished two pieces already.. Fortunately I managed to get 17 slices out of it. I hope it freezes, because as soon as it’s cool enough that’s where it has to go or it will all be gone by tomorrow. Next time I’m going to make it 4 seeded, and put a sprinkling of poppy seeds on top. Thank you so much for this recipe – l think! Wow, this recipe came out really well. The only substitution I made was to replace half the psyllium with whey protein powder. My loaf is crusty, seedy, well risen and delicious! Will be making it over and over. Hi, I too hate the eggy taste of most low carb bread recipes so I tweaked the 3 grain recipe as follows: replace 2 eggs with 3 egg whites whisked until frothy & add as per recipe. I also love the yeasty smell of baking bread (YUM!) so I mixed a sachet of yeast (about 1 tsp) into the warm water with 1 tsp of maple syrup which the yeast needs to activate. I let this froth up & then added to the mix. It is very good & no egg taste at all. Thanks for the recipe, I had a slice toasted with breakfast – best ever low carb bread! What size pan works best for this bread? Thank you goung to try tomorrow. Can I up the other seed quantities to replace the chia seeds?